Hello! I hope you are all having a fabulous weekend! I was able to play along in the Featured Stamper Challenge today on Splitocast. Today's FS is Darlene Pavlick, a.k.a. akronstamperdpk. She has a wonderful gallery! I chose to CASE this adorable scarecrow card. I'm just so excited for fall so I've been wanting to make fall cards : ) I kept the same layout and theme, but used this sweet scarecrow from the retired SU set Harvest Hello. I once again used dp from Recollections Autumn paper pack. I also decided to add the ribbon. I will leave a full recipe below and thank you so much for stopping by today! Have a wonderful rest of your weekend. Very cute and just right for FALL! Love the pumpkins in the corner! Your coloring is always SO GOOD, Kerri - - that little scarecrow is just perfect! I like how you have your sentiment panel too; those positions scare me. AWWWW Soooo cute Kerri I LOVE these fall colors you used!! Absolutely ADORABLE!!!! What a cute creation!! Fall is nearly here! This really is great!!!! Makes me smile! This is fantastic, Kerri!!! Wonderful colors, patterns, and cut work detailing!!! Great fall card!!! So cute! Great fall card, your papers are perfect. 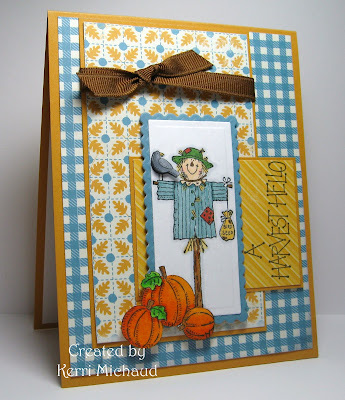 I've always liked that stamp set...love the color combo you used, it all puts me in the mood for Fall! Really cute card, Kerri. Sept starts tomorrow! That autumn paper is great. I like the addition of the ribbon, and your sweet pumpkins in the corner. They look so realistic! What a cute card! Love the pretty colors of the DP! This is adorable! I wish SU would have kept this little guy!!! Thanks for visiting my blog, too!